South Africa's status as a major cradle in the African nursery of humankind has been reinforced with today's unveiling of "Little Foot," the country's oldest, virtually complete fossil human ancestor. Discovered by Professor Ron Clarke from the Evolutionary Studies Institute at the University of the Witwatersrand in Johannesburg, South Africa, the fossil was given the nickname of "Little Foot" by Prof. Phillip Tobias, based on Clarke's initial discovery of four small footbones. Its discovery is expected to add a wealth of knowledge about the appearance, full skeletal anatomy, limb lengths and locomotor abilities of one of the species of our early ancestral relatives. "Many of the bones of the skeleton are fragile, yet they were all deeply embedded in a concrete-like rock called breccia," Clarke explains. "The process required extremely careful excavation in the dark environment of the cave. 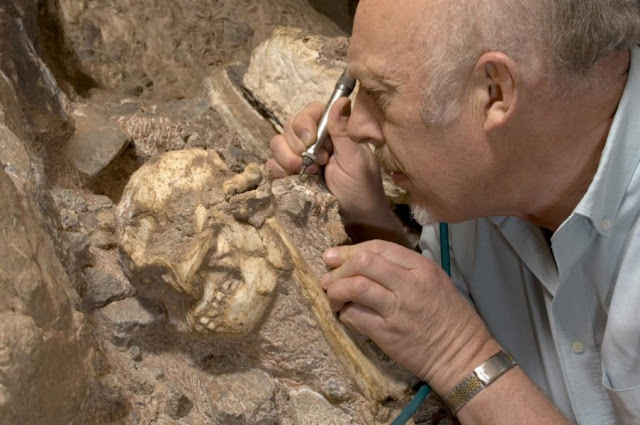 Once the upward-facing surfaces of the skeleton's bones were exposed, the breccia in which their undersides were still embedded had to be carefully undercut and removed in blocks for further cleaning in the lab at Sterkfontein," says Clarke. The 20-year long period of excavation, cleaning, reconstruction, casting, and analysis of the skeleton has required a steady source of funding, which was provide by the Palaeontological Scientific Trust (PAST) -- a Johannesburg-based NGO that promotes research, education and outreach in the sciences related to our origins. Among its many initiatives aimed at uplifting the origin sciences across Africa, PAST has been a major funder of research at Sterkfontein for over two decades. Professor Adam Habib, Vice-Chancellor and Principal of the University of the Witwatersrand says: "This is a landmark achievement for the global scientific community and South Africa's heritage. It is through important discoveries like Little Foot that we obtain a glimpse into our past which helps us to better understand our common humanity." PAST's chief scientist Professor Robert Blumenschine labels the discovery a source of pride for all Africans. "Not only is Africa the storehouse of the ancient fossil heritage for people the world over, it was also the wellspring of everything that makes us human, including our technological prowess, our artistic ability, and our supreme intellect," he says.